Based on the Disney Channel movie this popular musical comedy is now available from Animated Projections. The old school will never be the same especially when you use these fabulous projections. Based on the Rodgers and Hammerstein musical play written for television. Animated Projections has created a beautiful collection that will delight audiences both young and old. Nothing is “Impossible” with this fabulous collection of animated backdrops. Based on the whimsical and timeless works of Lewis Carroll “Alice in Wonderland” now can come to life with our colorful Animated Projections. Reaching a new level detail and design this collection will amaze and delight your audience both young and old. Meredith Wilson’s musical will always be a timeless classic. That fast-talking Prof. Harold Hill is no match for the sweet librarian, Marian Paroo. These stylish projections will certainly transport you to River City, a town that’s got a lot of trouble! First published in 1843 by Charles Dickens “A Christmas Carol” was immensely popular. The timeless story of Scrooge and his redemption is a joy to behold. This collection may be our most beautiful to date. Based on the 2003 hit film, “Elf” is the magical story of “Buddy” the orphan who sets out to find his dad. It’s the perfect holiday musical and with our Animated Projections it will be the perfect presentation for you. Based on the TV special from the 1960’s the holidays just aren’t complete without seeing “A Charlie Brown Christmas”. With our colorful Animated Projections your cast and audience will enjoy Charles M. Schulz’s perennial classic even more. “Big Fish” based on the 1998 novel by Daniel Wallace is about a father’s mysterious past and a son’s future. Let our projections will bring to life this whimsical tale, as a father’s tall tales from his past informs his son’s uncertain future. 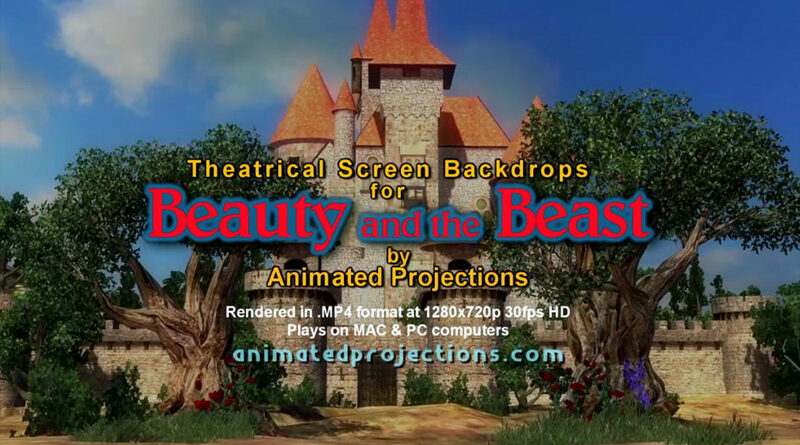 The hills and pretty much everything in our Animated Projections for the classic Rodgers and Hammerstein musical are alive. You’ll add so much more to your production with our amazing projections. There’s nothing “traditional” about Animated Projection’s collection for “Fiddler on the Roof” except maybe the old-world charm and emotional tension reflected in these amazing backdrops. Based on Margaret Landon’s story, Rodgers and Hammerstein created an instant classic for musical theater when they crafted “The King and I”. Our exquisitely animated scenes will certainly enhance your production. 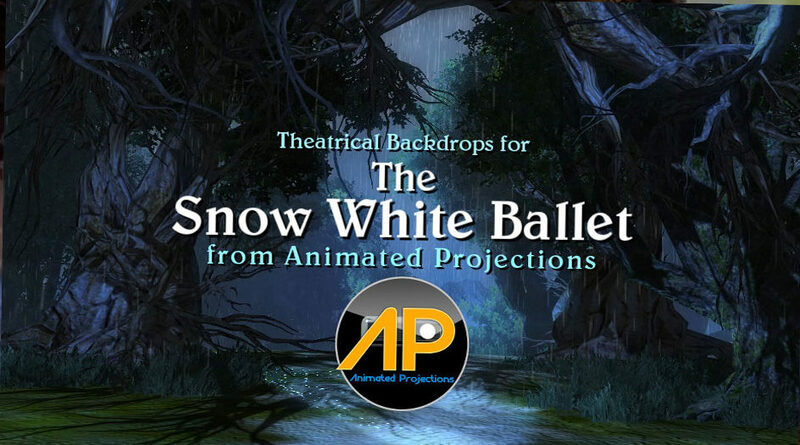 The classic Brothers Grimm fairy tale comes to life with Animated Projections beautifully render backdrops. From the Queen’s castle chamber, the Dwarf’s mine to the enchanted forest it’s all here for your production of The Snow White Ballet. From the novel by Frances Hodgson Burnett “The Secret Garden” comes the musical of the same name. 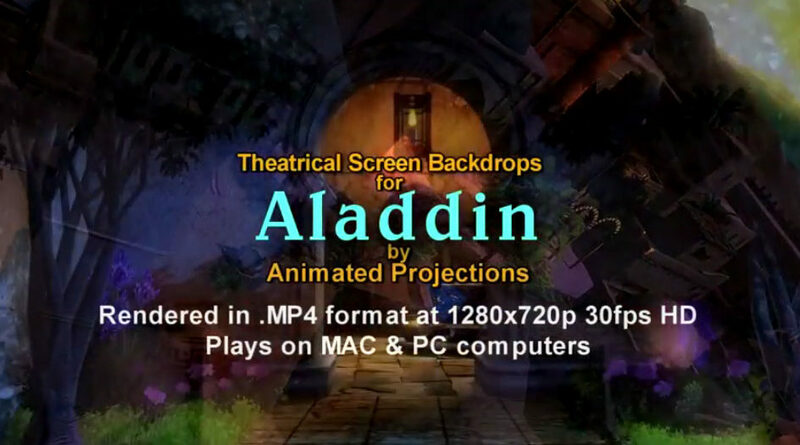 Animated Projections now adds this collection of video backdrops. These beautifully designed video backdrops will complement any production of this award winning musical. A Ghost Tale for Mr. Dickens (from The Magic Tree House Series) Based on the classic books by Mary Pope Osborne. This musical production follows Jack and Annie as they travel through time. In this adventure they will help the British author Charles Dickens write a very famous Christmas story. This moving and passionate musical by Andrew Lloyd Webber, Patricia Knop and Gale Edwards is set in the American south. It’s a story of faith, conviction in a small rural community and what are it’s consequences.